Something strange is going on. Large sections, shelves in my favorite crafts store are empty. Felt, stuffing material, Easter related items are nowhere to be seen. I felt like a hungry hoard of barbarians descended from the mountains and ransacked it. There must be something in the air! 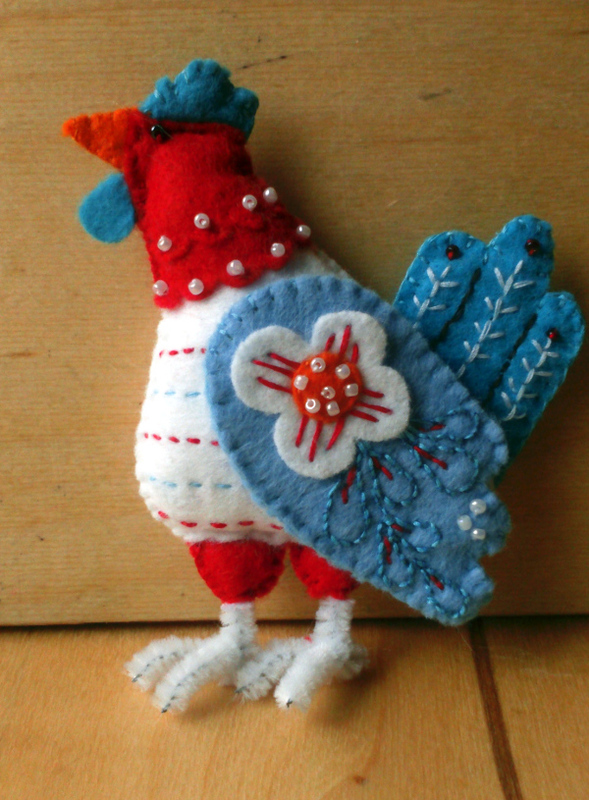 Nonetheless I decided I am not going to let this minor issue discourage me from completing my little hen. There are surely other ways to stuff the creature then regular stuffing material. I mean, there must have been something before polyester came around, right? After completing the wing for the bird I thought the rest will also take quite some time. What I did not realize was that only the wing had this intricate design, therefore the rest of the hen was ready before I anticipated. And I must say regular cotton wool makes quite good stuffing. The end result is not so soft and cuddly, but did its job. At first, when I was just looking at the pictures, the hen’s colors seemed a bit strange. I was not entirely sure about the combination of the different blues and the red, but decided to trust the design blindly and go with the flow. And I must say I am glad I did, because I love the end result. The combination of the delicate blue of the wing, the slightly darker tail with its contrasting embroidery and the white body is beautiful! 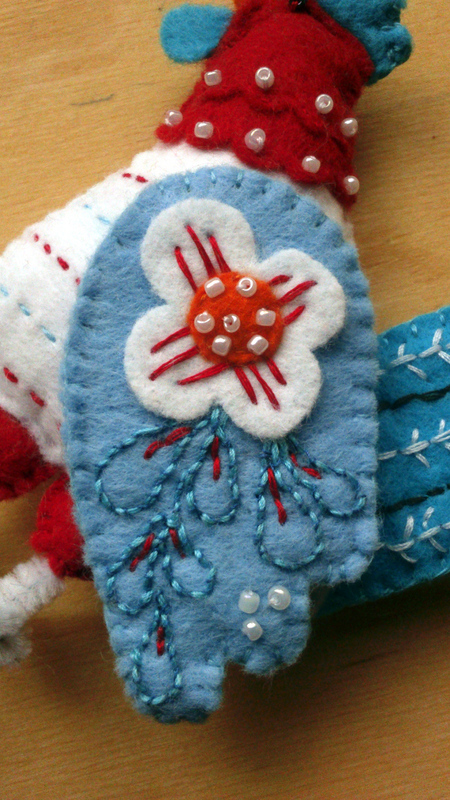 Even the red head and the blue comb and wattle are perfectly in harmony when combined with the rest of the design. And you know me, I must make something a tiny bit different, so instead of the little dots of paint I opted for sparkly glass beads. I love how they look and the little extra something they add to the neck. It is as if the hen received her own little pearl necklace. And finally the wing is attached to the hen. It was almost as putting on a beautiful evening gown. Before it as a little simple chicken, but after it became a dame. The more I keep thinking about where the hen is going to go, the shape and size of the wreath and the design I imagined the more I am thinking I want to change things up. 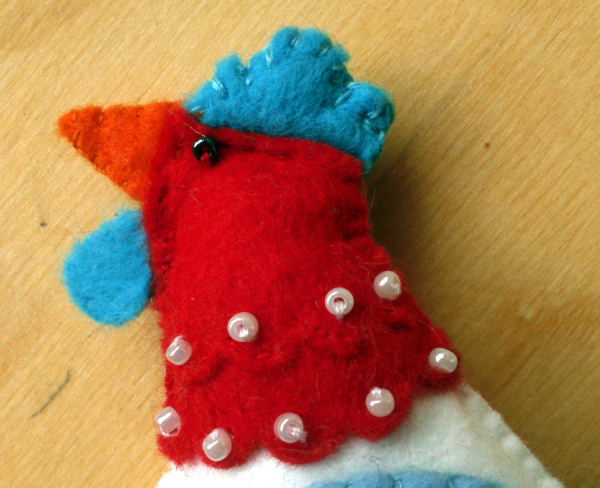 Originally I wanted to make some eggs out of felt, but I am not so sure any more. The more I keep thinking about it, the more I’d like the hen to have a companion. I mean symmetry is good. And hopefully the hen will not mind being so attached if she has company. Oh dear, which colored hen should I go for next?